Chase Hatfield on the hill for the Kokomo Wildkats. KOKOMO, Ind. – Better late than never. 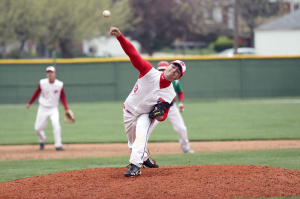 That is what recent Kokomo graduate Chase Hatfield was thinking when Ancilla College baseball coach Joe Yonto offered the Wildkat pitcher a spot on the Chargers roster. Ancilla, located near Plymouth in Donaldson, Ind., is a two-year institution that plays in the in the Michigan Community College Athletic Association and is a member of the National Junior College Athletic Association. Kokomo assistant coach Shawn Mayfield, sitting in at Hatfield’s signing for a vacationing Weeks, said Hatfield has great potential at the next level and Ancilla is a good stepping-stone for a potential move to a four-year program. “My goal as a coach is to teach first, make a positive impact on young people and help them advance towards their goals in life,” said Yonto, who arrived at Ancilla College after spending five years with the Cleveland Indians as a Vision Trainer, working with the major league players on tracking the ball and strengthening their eye muscles. Some of the players Yonto trained were Ellis Burks, Casey Blake, Alex Cora, Aaron Boone, Juan Gonzalez, Jose Hernandez, Ryan Ludwig, Travis Hafner, Kevin Kouzmanoff, Russell Branyan and CoCo Crisp. Now he sets his sights on Hatfield. Yonto said Hatfield should have an immediate impact on the Charger program. With a roster that rotates every two years, there are plenty of opportunities to get into a game and show what he can do. For Hatfield, that could be at more than one position. Hatfield said he has his eyes on a four-year degree in criminal justice, and would love to join the Federal Bureau of Investigation someday. Mayfield, a retired Kokomo police officer, thinks Hatfield has what it takes to reach that dream. While the offer may have come after he walked across the Memorial Gymnasium stage with his KHS diploma, it wasn’t too late for Hatfield. He will take the knowledge of playing in the North Central Conference against players like MLB No. 7 draft pick Trey Ball of New Castle – a player he once struck out – to the next level of play at Ancilla.